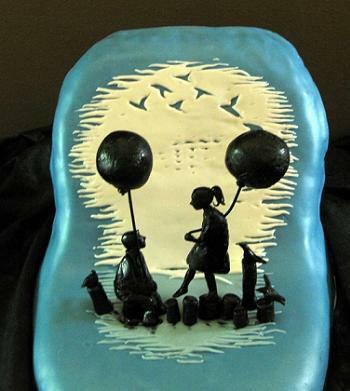 The August 3rd deadline for the Threadcakes Cake Contest is just a few days away, meaning that if you intend to throw your chef’s hat and artistic abilities into the ring, you had better get started. Iâ€™m one of the judges this year – along with Jen from Cake Wrecks, Louise from Cake Journal, Jennifer from Bake or Break and Mary Alice from Charm City Cakes/Ace of Cakes – and I have to say that based on the entries so far, all of us are going to have a tough decision to make! If you’re still thinking of entering, all you need to do is peruse the Threadless t-shirt design gallery and pick out your favorite design – then translate that design into a cake. 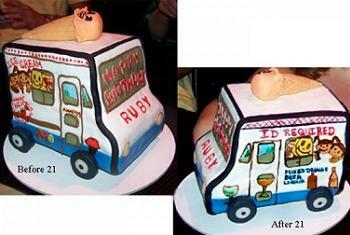 The cakes can be 2D (flat, with a design) or 3D, as there are prizes available for both categories. You can go ahead an enter as many times as you wish with as many designs as you can come up with before the deadline. I’m not giving any hints as to who I like so far, but below are a few images to show you what the competition looks like. Check out the full gallery to take a look at the entries so far! 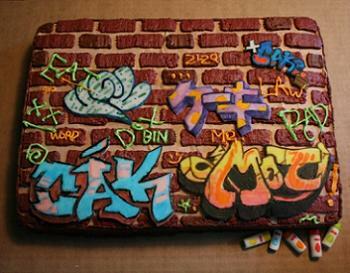 Hey, that’s my graffiti cake! 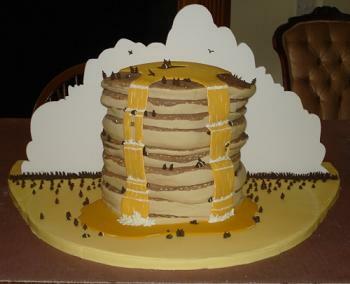 Awesome, thanks for the recognition (and the chocolate french toast recipe)!